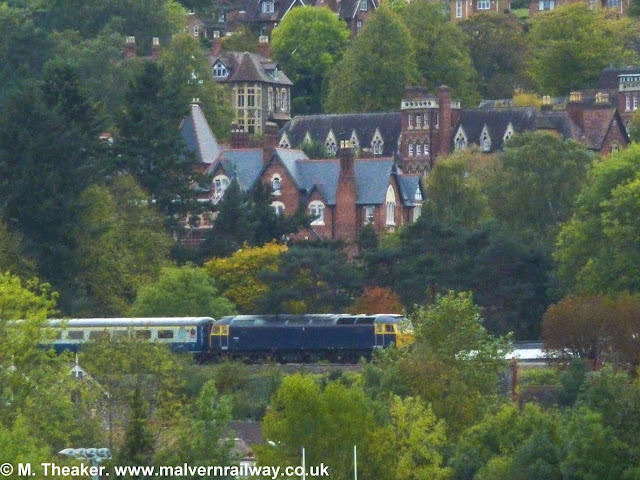 Thanks to a tip-off from a helpful contact I was able to catch the return leg of this railtour last weekend as it passed through Malvern. Unfortunately, the light was fading fast around half past four as the train moved across the hills, and to top it all off I didn't have my regular camera to hand either, resulting in this slightly underwhelming effort. I did my best to blur out the worst of the ISO grain and to perk the image up using a combination of Adobe Lightroom and GIMP editing software, but couldn't avoid a slightly over-contrasted and over-saturated product. Never mind, anyway - here's 47848 pulling the 'Lickey Incliner II' on a dull October evening!